REAL SELF CARE: Whether it's a 1-step or 2-step back, doesn't matter, just take a step back from your life now and then to breathe, review, rest or do some self care. Sometimes we get caught up in the "craziness of life." There comes a time when we need to disconnect from the "external voices" in life, you know...the husband, wife, kids, family members, boss, radio, TV, computer, etc....And Reconnect with the Real Voice...your inner voice. 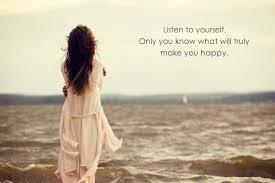 When it comes down to it...your inner voice is the one that has your best interest at heart!